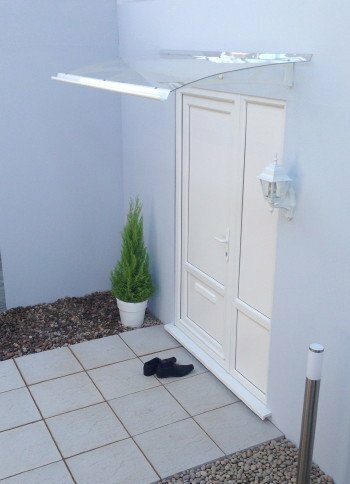 Cost effective Lightline Stainless Steel/Perspex 2-beam Door Canopy. Easy to install the lightline Easy-Top door canopy protects a front entrance, whilst at the same time enhancing its appearance. The solid 3mm polycarbonate and metal parts are completely UV resistant. Low maintenance, easy-clean and long-lasting. Lightline Easytop Door Canopy Size: 1800 x 900mm Cost effective Lightline Stainless Steel/Perspex 3-beam Door Canopy. Easy to install the lightline Easy-Top door canopy protects a front entrance, whilst at the same time enhancing its appearance. The solid 3mm polycarbonate and metal parts a..
Colour: Clear Size: 1400mm x 900mm Description Easy Installation * Easy Cleaning * Long Lasting Slim stylish stainless steel support brackets The eye catching EASY-TOP product protects your front entrance, while at the same time enhancing its appearance. The solid 3mm polycarbonate sheet..